Malayalam superstar Mammootty visited veteran actor and villain Jose Prakash at his son Rajan's house in Vyitila near Ernakulam to wish him on his 84th birthday. Mammootty met Jose Prakash who was in a wheel chair. 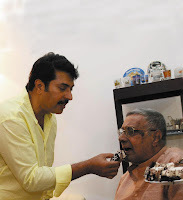 With a group of family members and media persons, Jose cut the birthday cake and Mammootty served a piece of cake to him. Jose Prakash said he was lucky to have Mammootty on his birthday and even proud to say that he still remembers him despite his busy schedule as a superstar. Mammootty said Jose Prakash is a father figure to him. Having acted together in many movies as hero and villain, they spent some time to chat about their experiences in cinema. Starting his career in films in 1961, Jose Prakash has acted in more than 58 movies.